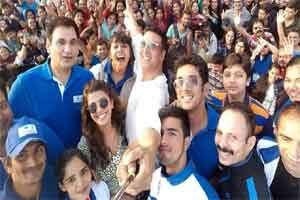 Actors Akshay Kumar and Nimrat Kaur flagged off the fourth edition of Max Bupa Walk for Health here on Sunday. The initiative has been inspiring thousands of families to walk more to enhance their overall health and well-being. Extending support to the initiative, Akshay said in a statement: “Walking is an intrinsic part of my fitness regime. I strongly believe that walking is a great way to stay fit and encourage everyone to start walking, since it is one of the easiest and most effective ways to get healthier. Nimrat also shared a similar view. “Regular walking should be practised by all ages as it not only keeps you fit and energised but also makes you look fabulous and in-shape all the time. I’m a walking enthusiast and go for a regular morning walk to the beach. “Walking is a great way for women to stay fit and I encourage everyone to start walking as it is the easiest and the best way to get healthy,” she said. In an attempt to encourage the entire nation to walk more and discover the multiple benefits of walking, Max Bupa Walk for Health this year has transformed into a 33-day walking event which will touch upon 15 cities including Mumbai, Pune, Surat, Ahmedabad and Jaipur, and will conclude in Delhi on February 14.